Dan-Air's parent Davies and Newman had been engaged in shipbroking in the City of London since 1922. It began as an iarline in 1953. Initially the company was founded as an air charter broker from an office at London's Baltic Mercantile and Shipping Exchange. Amongst Davies and Newman's clients for whom it acted as an air charter broker was a small airline called Meredith Air Transport. Meredith had been formed in 1952 as a small, ad hoc charter operator and flew a single Douglas DC-3 out of Southend Airport, where it also had its head office. When Meredith's only aircraft suffered a mishap during take off from Jerusalem's Atarot Airport on Christmas Eve 1952. The accident damaged the aircraft's tailwheel, causing major disruption to the company's business. As a result, Meredith soon found itself in financial difficulties. Davies and Newman agreed to take a debenture on Meredith's aircraft in return for extending financial assistance. 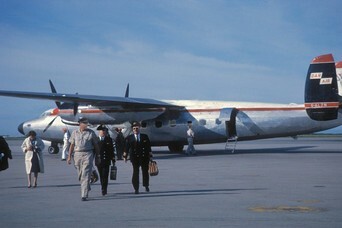 When Meredith's financial problems worsened and the debenture became due for repayment, Davies and Newman took over the aircraft together with a six-month contract to operate a series of charter flights between Southend and West Berlin's Tempelhof Airport that formed part of the second Berlin Airlift. Dan-Air began commercial air services in the United Kingdom in May 1953 with the aircraft it had taken over from Meredith Air Transport, a now repaired, single Douglas DC-3 bearing the registration G-AMSU. The fledgling airline received its air operator's certificate on 23 May 1953. Dan-Air derived its name from its parent's initials, Davies And, Newman. The company was incorporated on 21 May 1953 as Dan Air Services Limited with a capital of £5,000. 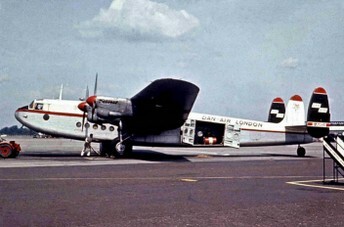 To emphasise that this was a British rather than a Danish company, the airline's aircraft displayed the suffix "London" with the Dan-Air name on both sides of the fuselage. This convention was followed until the year before Dan-Air's takeover by British Airways, when the "London" was dropped from fuselage titles. 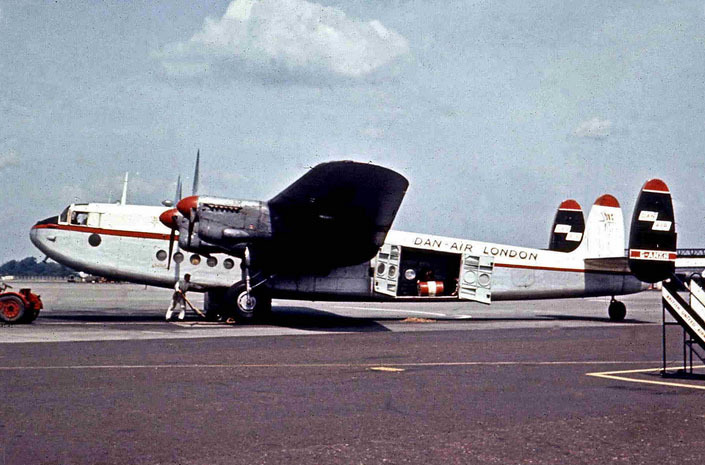 Dan-Air's first commercial service – an ad hoc charter flight from Southend via Manchester to Shannon – occurred in June 1953. 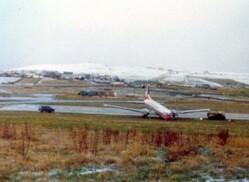 Operations initially continued from Meredith's old base at Southend Airport, where Meredith managed Dan-Air's operations for the first six months. 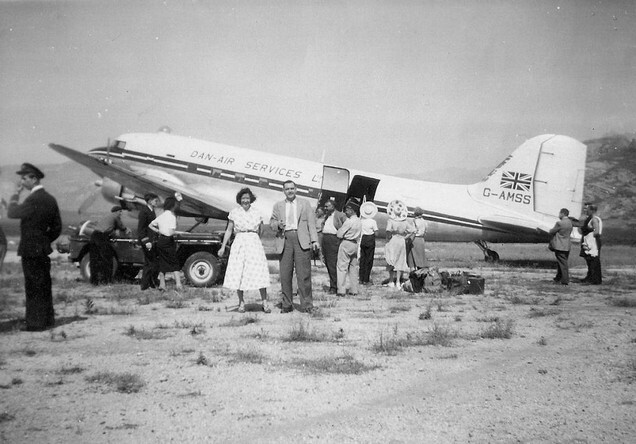 (Following the end of Meredith's contract to manage Dan-Air's operations at Southend, Meredith Air Transport changed its name to African Air Safaris on 29 November 1954. Dan-Air operated inclusive tour (IT) charter flights, regional short-haul scheduled services, transatlantic and other worldwide affinity group / Advanced Booking Charters (ABC flights), oil industry support flights and ad hoc operations including all-cargo services from London Gatwick, other British airports and Tegel Airport in West Berlin. Dan - Air operated the world's largest fleet of de Havilland Comets and was the last in the world to operate them. Dan-Air built a 49-strong Comet fleet between 1966 and 1976. It retired the last example in November 1980. Not all of these airframes saw airline service; some had been exclusively acquired for spares. The Comets commanded a lower price than comparable second-hand jets. They were relatively unused as many previous operators had replaced them with the larger and more economical Boeing 707 and Douglas DC-8 after only a few years. The airframes had many years of service left and cost a fraction of the similarly sized BAC One-Eleven 500 or Boeing 737-200, the availability of which was very still scarce second-hand. It allowed the Dan - Air to relatively cheaply replace most of its piston-engined airliners – such as the Avro York, the Bristol 170 Freighter and the Airspeed AS 57 Ambassador – which had reached, or were nearing the end of their lives. Dan - Air was the last commercial airline operator of the Ambassador. These aircraft had initially been purchased by British European Airways as the 'Elizabethan Class'. BEA had purchased newer, turoprop Viscount aircraft. The piston engined Ambassador was, by comparison, noisy and uneconomic. A small number of this high-winged, twin-engined plane survived in the fleet into the jet era. The last retired in September 1971 after its final Jersey–Gatwick scheduled service. It was then flown to Lasham in Hampshire (Dan - Air Engineering Base) where it remained until it was donated to the Imperial War Museum at Duxford. It has been lovingly restored and is now on permanent display in Dan - Air colours. Dan - Air was the first British operator of the Boeing 727 trijet, at the time the world's best-selling commercial jetliner. The first of three former Japan Airlines Boeing 727-100 series was introduced on 13 April 1973. The aircraft needed a full stall protection system fitted to meet British civil airworthiness requirements. Dan - Air's original eight Boeing 727-100s, which entered service between 1973 and 1978, differed from overseas-registered aircraft. Dan-Air's examples featured additional emergency doors each side of the rear fuselage as well as a stall-protection system known as a "stick pusher". The additional exits were needed for having the aircraft certificated for an increased maximum seating capacity of 150. Something the type had never achieved before. This necessitated satisfying the British Civil Aviation Authority (CAA) requirement that all passengers could leave within 90 seconds using only half the available exits. Stall protection had been introduced in the light of experience with the stalling characteristics of both civil and military British T-tailed jet aircraft, including the loss of a Hawker Siddeley Trident on a test flight over Norfolk when it entered a deep stall. This stall-protection system consisted of a stick pusher, a "nudger" and an independent "shaker" for each pilot. When the aircraft was in danger of stalling it warned the pilots by shaking the control columns as well as correcting attitude and altitude, in an attempt to increase air speed and so avert an irrecoverable deep stall. It was estimated that installing stall-protection cost Dan-Air £100,000 per aircraft and up to £1 million for the entire fleet. The Beoing 707 joined the fleet in 1970 and flew for almost a decade, working mainly on the Transatlantic ABC / affinty group charters. These aircraft also flew charters around the World for specialist tour operators. The company also purchased a large number of the British built BAC 1-11 jet. The first such model was purchased from American Airlines in 1969. It flew a large fleet of Hawker Siddeley 748 aircraft and was the launch customer of the British Aerospace 146. In the 1980s the jet fleet was complemented by the addition of Boeing 737 aircraft. A releatively late customer of the jet the aircraft became a late part of the company with serveral 200,300 and 400 joining the airline. Dan - Air joined the wide body market in 1988 when three Airbus A300 aircraft entered service. Over the 39 year history of Dan - Air 20 types saw commerical service. Dan - Air's acquisition of three ex-RAF Transport Command Avro Yorks in 1954 resulted in establishment of Dan-Air Engineering as a sister company at Lasham, a disused war-time airfield in Hampshire, to service its fleet as well as other operators. The airline purchased a second DC-3 in 1954 resulting in Dan - Air moving its main operating base from Southend to Blackbushe the following year. The main base transferred to Gatwick in 1960 when Blackbushe closed to commercial airlines. Dan-Air's arrival at Gatwick in 1960 coincided with the entry into service of three former Butler Air Transport Airspeed Ambassadors, the airline's first pressurised aircraft. This heralded the beginning of a major expansion into the IT charter market, including its first charter programme from Manchester. Horizon Holidays was one of the first tour operators to contract the airline's aircraft. The Ambassador fleet numbered seven aircraft by the mid-1960s and operated the majority of the company's IT flights until Comets and One-Elevens assumed the bulk of these operations towards the end of the decade. In 1966, Dan - Air introduced its first pair of ex-British Overseas Airways Corporation (BOAC) de Havilland Comet series 4 aircraft, which made it the second British independent airline after British United Airways to start uninterrupted pure jet operations. This marked the beginning of sustained, steady and mostly profitable expansion. By the end of the 1960s, Dan-Air had become Gatwick's third biggest resident operator after British United Airways and Caledonian Airways. The Ambassadors were introduced to the growing network of Tour Operators and flew 55 passengers to Mediterranean resorts as well as Northern European destinations. In October 1970, the US Civil Aeronautics Board granted Dan-Air a foreign carrier permit for a five-year period. This became effective on 5 April 1971 and enabled the airline to operate regular transatlantic affinity group charter flights between Britain and the US. To assist with marketing its transatlantic capacity to affinity group charter organisers in both countries, Dan-Air established a new joint venture named Dan-Air Intercontinental in partnership with CPS Aviation Services as a jointly owned subsidiary. Flights began in late-March 1971 with a Boeing 707-321 that was acquired second-hand from Pan American World Airways (Pan Am). The successful launch of Dan-Air's transatlantic joint venture led to the acquisition of a second 707-321 from Pan Am in 1972, and both aircraft continued to be primarily employed on transatlantic charter flights between Britain, Canada and the US until their retirement in 1978. Dan-Air's parent, Davies and Newman Holdings, became a publicly listed security when it was floated on the London Stock Exchange in late 1971. The group was capitalised at £5 million at its stock market debut. This provided the funds to expand its charter business, build a network of regional scheduled services between secondary airports across Europe (with particular emphasis on the United Kingdom and Ireland), enter the transatlantic affinity group/ABC market and establish itself as leading fixed wing operator of oil industry support flights. It let the airline expand its fleet, leading to introduction of the One-Eleven, Boeing 707, Hawker Siddeley 748, Boeing 727, Boeing 737, BAe 146 and, eventually, the Airbus A300. In it's early history Dan - Air purchased aircraft second-hand. The the 1980s newer BAe146 and Boeing 737 aircraft were brand new. In 1972, Dan-Air co-founded Gatwick Handling, a Gatwick-based handling agent, with Laker Airways. Each owned 50% at its inception. By the mid-1970s, Dan-Air had become the second biggest resident operator at Gatwick after British Caledonian. From then on, it operated the largest of the UK independent airlines' fleets as well as Britain's largest charter fleet. Operating a large fleet comprising aircraft of various sizes gave the airline unrivalled flexibility among European charter carriers to meet the requirements of different tour operators. In the UK, Dan-Air was second only to British Airways in fleet size. For most of this period, Dan-Air had more than 50 aircraft, employed over 3,000 people and by the end of the 1980s carried 6 million passengers annually, almost one-third on scheduled services. Dan - Air marked the 1980s with a corporate makeover. The first stage entailed a new fleet-wide livery. One Boeing 727–100, the airline's first pair of stretched Boeing 727–200 Advanced and its first Boeing 737 were first to appear in the new livery. The second stage gave the fleet widebody look interiors as each aircraft underwent maintenance. The final stage changed stationery, ticket wallets, timetable covers, airport signs and baggage tags as well as its logo in advertisements and public relations campaigns. By the time British Airways took over British Caledonian, Dan-Air had become Gatwick's second-largest slot holder, accounting for 16% of slots. Dan - Air provided the chairman of the Gatwick Scheduling Committee while British Caledonian, Gatwick's largest slot holder, provided the [slot] co-ordinator. Dan - Air's first overseas expansion occurred during the Cold War in 1968 when Frank Tapling, the sales director, visited German tour operators to increase utilisation of the growing Comet fleet and take advantage of the fact that all airlines other than those headquartered in the US, the UK and France were banned from West Berlin. Operating out of West Berlin let Dan-Air redeploy capacity left surplus in the UK due to sterling's devaluation and exchange controls which limited passengers to £50 a trip, and to obtain better rates than in the oversupplied UK charter market. The Comets' low acquisition costs also enabled Dan-Air to offer German tour operators with flying programmes from West Berlin keener rates than other Allied charter carriers – chiefly, fellow British independent Laker Airways and US airline Modern Air. Dan - Air operated ex-Pan Am Boeing 707–321, registration G-AZTG (ex-N722PA), out of Berlin Tegel Airport during winter 1974–75. March 31st 1968 marked the beginning of Dan-Air's association with Tegel which lasted 25 years. On that day, a Comet 4 left the airport for Málaga, the first of almost 300 IT flights under contract to West German tour operator Neckermann und Reisen. Dan-Air established its first overseas base at Tegel in 1969. Up to five aircraft were stationed there for over two decades. These initially comprised Comets, One-Elevens, Boeing 707s and 727s. They were later replaced with Boeing 737s, Hawker Siddeley 748s and BAe 146s. The Berlin fleet operated charters under contract to tour operators as well as scheduled services to Amsterdam and Saarbrücken. Gatwick aircraft and crew operated most regular charter flights as well as all scheduled services linking Berlin with Gatwick. At its peak during the late 1970s and early 1980s, Berlin was staffed by 170, mainly local, employees and handled more than 300,000 passengers annually. Dan - Air's Berlin 727s had additional fuselage fuel tanks to fly non-stop to the Canary Islands with a full payload. At 2,200 miles (3,500 km) the distance between Berlin and Las Palmas was greater than the shortest transatlantic crossing between Shannon in western Ireland and Gander in eastern Canada. The five-hour flight was the limit of the 727's economically viable non-stop range. The Berlin 727-100s' enhanced fuel capacity also meant that these aircraft had up to 20 fewer seats compared with their UK counterparts – 131 versus. 151 – to take full advantage of the resulting range increase. This in turn permitted Dan-Air to offer its German charter passengers an improved seat pitch, in line with German tour operators' requirement for a more comfortable seating arrangement as opposed to the then prevailing "high-density" configurations on most UK charter aircraft. Dan - Air operated the first commercial flight to Tegel's new terminal building on 1 November 1974 at 6am with a One-Eleven inbound from Tenerife. 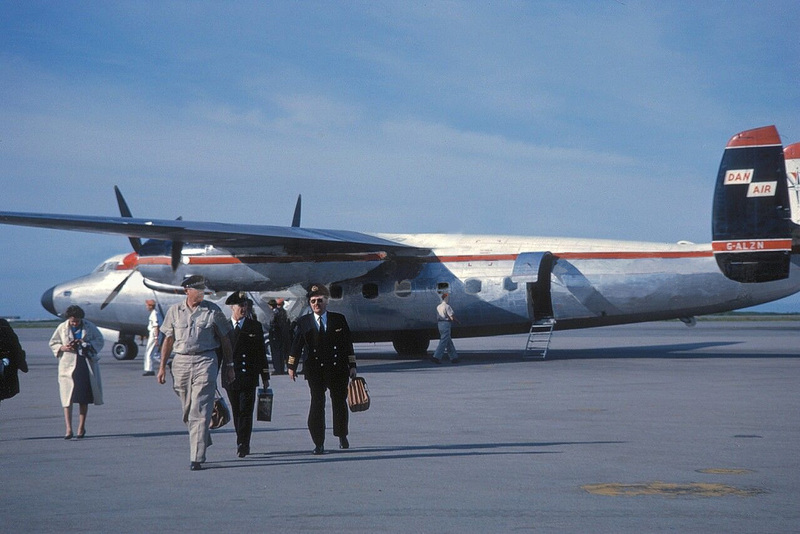 Dan-Air operated its first seasonal scheduled service during summer 1956 between Blackbushe and Jersey. It operated its first year-round scheduled service in 1960, linking Bristol and Cardiff with Liverpool. That service was inaugurated with a pair of de Havilland Doves. Subsequent changes included extending the service from Bristol to Plymouth, and replacing Doves with larger Herons and DC-3s. The resulting route pattern became the foundation of the Link City network. This linked the Southwest England with the Northeast via stops at the commercial centres of the Midlands and the Northwest. DC-3s continued plying all domestic Link City scheduled routes for the first ten years. The first international scheduled route was launched in 1960, linking Bristol and Cardiff with Basle. Further international scheduled services from Liverpool to Rotterdam, Bristol to Basle via Bournemouth as well as from Bristol and Gatwick to Ostend followed during the early 1960s. These were operated with DC-3s and Airspeed Ambassadors. Dan - Air operated this Nord 262 on its scheduled UK internal Link City routes during 1970–72. Dan - Air's purchased Scottish Airlines and Skyways International in 1961 and 1972 and this enlarged the scheduled operation. Scottish Ailines had a passenger-configured DC-3 and a seasonal route linking Prestwick with the Isle of Man. Skyways International's aquisition resulted in four additional HS 748s and year-round services linking Bournemouth with Jersey and Guernsey, as well as seasonal flights linking Gatwick with Clermont-Ferrand and Montpellier. These aircraft allowed Dan - Air to expand the Link City network by adding Bournemouth. Also reorganising the structure by introducing Bournemouth – Birmingham – Liverpool / Manchester – Newcastle and Luton– Leeds/Bradford – Glasgow,. In April 1972. Schedules offered same-day-returns Monday to Friday. These ex-Skyways HS 748s enabled Dan-Air to open a seasonal Gatwick – Bern route. In June 1972, the first direct scheduled air link between the UK and the Swiss capital was started . The acquisition also resulted in the HS 748 becoming the main scheduled aircraft for the next ten years. As a consequence, HS 748s replaced the Nord 262 Dan - Air had acquired from Air Ceylon in 1970 as a DC-3 replacement to operate Bristol – Cardiff – Liverpool – Newcastle. In addition, Skyways brought a scheduled route linking Ashford (Lympne) Airport in Kent with Beauvais. This formed part of a London – Paris coach-air service, which Skyways had pioneered in 1955 with DC-3s. Dan - Air continued this service until the early 1980s. When Ashford closed in 1974, services moved to Lydd. HS748s, One-Elevens and Vickers Viscounts leased from other operators operated these services. In 1973, Dan - Air added Teesside as a stop to Link City and inaugurated scheduled services between Teesside and Amsterdam. In 1974, Dan - Air began replacing the 748 with Comets and One-Elevens on its seasonal, scheduled services between Gatwick, Clermont-Ferrand and Montpellier, as well as on its year-round Luton–Leeds–Glasgow schedule, the first time the airline had used jets on scheduled services. The turboprop capacity that had been released enabled re-introduction of scheduled services between Bristol, Cardiff and Amsterdam, as well as the launch of direct scheduled services between Newcastle and the Isle of Man. During April that year, Dan - Air launched a year-round, same-day-return Gatwick – Newcastle jet schedule, the airline's first UK mainland domestic feeder route from Gatwick. This twice - daily service, promoted with British Caledonian, initially utilised Comet 4Bs. From November 1974, BAC One-Eleven 300/400s replaced Comets on one of the rotations.In May 1974, Dan - Air launched a twice - daily Gatwick – Ostend service using HS 748 aircraft, in conjunction with Sabena. One of the two daily round-trips was operated under Sabena flight numbers. In 1975, Dan - Air commenced a year-round scheduled service between Newcastle and Bergen, as well as two new, seasonal scheduled routes linking the Isle of Man with Aberdeen and Gatwick. The latter was the first non-stop scheduled air service between Gatwick and the Isle of Man. 1975 was also the year the airline converted its seasonal Gatwick–Bern scheduled service into a year-round operation. During that year, the company extended its seasonal scheduled service between Gatwick and Clermont - Ferrand to Perpignan, and introduced One-Eleven jets on its seasonal, Gatwick – Jersey schedule. 1975 furthermore saw the acquisition of two former Zambia Airways One-Eleven 200s, the first time the firm had acquired jets to be exclusively operated on scheduled services. One aircraft was based at Gatwick, the other at Newcastle. Moreover, 1975 was the year Manchester became the sole stop in the Northwest on the Link City Network. In 1976, Dan - Air commenced a year-round scheduled service between Newcastle and Stavanger. In 1977, Dan - Air launched a scheduled route from Gatwick to Strasbourg. 1978, Dan-Air's silver jubilee, saw the launch of a scheduled service linking Gatwick with Bergen. In November 1979, Dan - Air replaced British Airways as scheduled carrier between Gatwick and Aberdeen, a feeder route for the oil industry.1979 also saw the launch of a Gatwick–Toulouse scheduled service. In April 1980, Dan - Air took over British Airways's loss-making regional services from Bristol, Cardiff and Newcastle to Belfast and Dublin, as well as from Bristol and Cardiff to Jersey, Guernsey and Paris Charles de Gaulle, and from Leeds/Bradford to Guernsey. 1981 saw Dan - Air launch a scheduled route linking Gatwick with Cork, its first scheduled service from Gatwick to Ireland, as well as a new, seasonal scheduled service linking Newcastle with Jersey and a new, year-round combined Gatwick – Newcastle– Aberdeen weekend schedule. During that year, the airline inaugurated scheduled services between Berlin and Amsterdam Schiphol, the company's first scheduled route from Berlin as well as its first scheduled route not to touch the UK. In addition to that in November, Dan - Air withdrew its application to the CAA to take over British Airways's Highland and Islands scheduled operation. During 1981 and 1982, Dan-Air leased three HS 748s to British Airways to supplement BA's 748 fleet on Scottish internal routes. The partial liberalisation of the Anglo-Irish bilateral agreement during the early 1980s enabled Dan - Air to commence scheduled operations on Gatwick–Dublin in 1982. As the recession began to bite and passengers for Link City dwindled, the company contracted them to regional airlines operating smaller aircraft. 1982 saw Metropolitan Airways, a subsidiary of Alderney Air Ferries (Holdings), take over Dan-Air's Bournemouth – Cardiff / Birmingham – Manchester – Newcastle schedule. In March 1983, Dan-Air took over British Airways's loss-making Heathrow – Inverness route. This was the first time the airline had operated a scheduled service out of Heathrow. In May 1983, the company flew the world's inaugural BAe 146 scheduled service between Gatwick and Bern, the first commercial jet service into the small airport serving the Swiss capital. The same year, the company started scheduled Gatwick – Zürich flights, the second time it had launched daily scheduled services on a European trunk route. In November 1983, Dan-Air joined Travicom, the computer reservation system (CRS) used at the time by travel agents in the UK. January 1984 saw Dan - Air take over Touraine Air Transport's scheduled internal German operation between Berlin and Saarbrücken, the first time the airline had operated a scheduled route entirely within another country. That year also saw Dan - Air assume British Midland's scheduled route between Gatwick and Belfast International Airport as well as launch a scheduled Manchester – Zürich service. In May 1984, Dan - Air began stationing an aircraft in Jersey, increasing the frequency of its scheduled service to Gatwick and converting it into a year-round operation. In addition, 1984 was the year Metropolitan took over Dan-Air's remaining Link City schedules between Bristol, Cardiff, Leeds and Glasgow. In 1985, Dan-Air inaugurated a seasonal scheduled route linking Gatwick with Innsbruck, operated with a BAe 146. Innsbruck was the airline's first scheduled destination in Austria, which began receiving commercial jetliners on a scheduled basis for the first time. 1985 was also the year Dan - Air launched a year-round Manchester–Newcastle–Oslo scheduled route, the company's first scheduled services to the Norwegian capital. In 1986, Dan-Air launched a year-round non-stop Manchester–Amsterdam scheduled service. In 1987, Dan - Air began a scheduled service between Gatwick and Lisbon, its first scheduled service on a main trunk route between the UK and the Iberian peninsula. The same year, the airline joined the International Air Transport Association (IATA) as a Trade Association member. Dan - Air added a second Heathrow route with the Heathrow - Manchester sevices commencing in competition to British Airways. Dan - Air began with five flights a day each way. It had timed its flights not to be in direct competion with BA. British Airways responded by increasing the number of flights it had on the route, with some timed to depart minutes before each Dan - Air flight. Dan - Air reduced the number of flights to three a day, then one and finally it withdrew from the route. Using Heathrow was a costly process and unless load factors were high then it is ineffective flying from the airport for the sake of it. Following British Airways's takeover of British Caledonian in December 1987, Dan - Air's scheduled services transferred to Texas Air's SystemOne CRS. In 1988, Dan - Air commenced scheduled services between Gatwick and Madrid. Towards the end of that year, the airline also assumed the former British Caledonian routes from Gatwick to Paris Charles de Gaulle, Manchester, Aberdeen and Nice, gaining access to some of Gatwick's most important feeder routes, as well as some of the densest and most lucrative short-haul European trunk routes. At the start of the 1988–1989 winter timetable, Dan - Air became a two-class scheduled airline when, under the stewardship of Vic Sheppard, it introduced its Class Elite business class between Gatwick and Paris and between Gatwick and Nice on three refurbished One-Eleven 500s. Sheppard had joined Dan-Air from British Caledonian. In 1989, Dan - Air introduced Class Elite on all scheduled flights from Gatwick to Dublin, Zürich, Lisbon, Madrid and Toulouse. The start of the nineties saw Dan - Air introduce year-round two-class scheduled services from Gatwick to Tegel and Vienna. Gatwick – Tegel was Dan - Air's first scheduled link between its main UK base and its long-established overseas base. At the start of the 1990–1991 winter timetable, the firm replaced one of the two Berlin HS 748 turboprops with larger BAe 146 jets on Berlin – Amsterdam and introduced direct scheduled services linking Berlin with Manchester and Newcastle via Amsterdam. In addition, the company took over the Gatwick–Amsterdam feeder route from British Airways. Following Air Europe's demise at the end of the first week of March 1991, Dan-Air began assuming most of the failed carrier's scheduled routes from Gatwick, starting with Gatwick–Brussels and Gatwick–Oslo. Dan-Air's rival's collapse also enabled it to increase frequencies and introduce larger aircraft on the busy Gatwick – Charles de Gaulle and Gatwick–Manchester routes. At the start of the 1991–1992 winter timetable, Dan - Air increased the frequency of its Gatwick – Charles de Gaulle Airport services to nine return flights per day and Gatwick – Manchester to eight daily returns. The airline replaced BAC 1-11 500s with Boeing 737s on both routes. From then on, Dan - Air carried more scheduled passengers than British Caledonian had ever carried in one year throughout its existence. The expansion of Dan - Air's scheduled operation at Gatwick continued throughout 1992, resulting in the resumption of former Air Europe routes to Stockholm Arlanda in February and Rome Fiumicino in April. In addition, Dan-Air launched Gatwick–Athens in March and re-launched Gatwick–Barcelona in May. During that period, Dan - Air became Gatwick's largest resident, short-haul scheduled operator controlling 18% of all slots, and 21% of all morning peak time slots between 8am and 9am. In addition to scheduled services on its own account, Dan - Air was also contracted by other airlines to operate scheduled passenger and cargo services. In 1959, British European Airways (BEA) awarded Dan - Air a two-year contract to operate its six-times weekly scheduled freight service between Heathrow, Manchester and Glasgow's old Renfrew Airport using Avro York freighters. From 1960, BEA awarded Dan - Air additional contracts to operate its freight services from Heathrow to other destinations in the UK and Continental Europe. The airline eventually replaced the DC-3s, which it had used to operate these latter services, with Avro Yorks. For a couple of months starting in October 1968, Kuwait Airways contracted its entire scheduled operation to Dan - Air, who supplied flight deck crews to man Comets while their own pilots underwent conversion training on the Boeing 707 in the US. During the 1970s, IAS Cargo Airlines sub-contracted Dan - Air to operate Zambia Airways's weekly scheduled Heathrow – Lusaka all-cargo service with a small fleet of 707 freighters in hybrid Dan-Air/IAS Cargo Airlines colours. Dan - Air ordered its first new aircraft in 1969, a single Handley Page Jetstream to replace the DC-3 assigned to the Link City Network. However, the order lapsed when Handley Page went into liquidation in 1970. Despite the negotiations being at an advanced stage, with the manufacturer's future in doubt, it was difficult to finance the purchase and the order could not be completed. the Jetstream wa one of the two models chosen for evaluation. The other was the Nord 262. Two examples of the type entered service. Dan - Air ran its first transatlantic charter flight in October 1969 from Gatwick to Trinidad with a Comet. Dan - Air operated a dozen 707 round-the-world charters for German tour operators during the mid-1970s. Dan-Air was among the first UK airlines to employ female pilots, with five among 550 during 1978. Dan - Air the first UK airline to have a female pilot in command of jet aircraft. Yvonne Sintes, who had started her career as an airline pilot with Morton Air Services in 1965, joined Dan-Air as a Bristol-based DC-3 first officer in 1969. She gained her command as a captain on the HS 748 fleet before becoming a One-Eleven captain in 1975. Sintes flew One-Elevens and Comets until her retirement in 1980. During its 39-year history, Dan-Air passed several important passenger number milestones. In 1960, Dan-Air carried 100,000 passengers. It carried 500,000 passengers in one year for the first time in 1969. 1971 saw more than 1 million passengers. 1973 was the first year the company carried more than 2 million passengers. 1977 saw more than 3 million. Four million was reached in 1978r, the silver jubilee. It took until 1985 to reach 5 million. In 1989, over 6 million flew with Dan - Air, the highest number ever. 1984 was the year Dan - Air carried more than 1 million scheduled passengers for the first time. Between 1966 and 1980, Dan-Air's 38-strong, active Comet fleet carried 8 million passengers. 1989 marked a watershed – it was the first year since the era prior to the decision to introduce jets in the mid-1960s, and the only time apart from a blip in 1981–1982, when the company lost money over a whole 12-month period. The loss of £3 million was in contrast to the profit of £10 million made the year before. Like most charter-focused operators, Dan - Air used to make a loss during the winter because of the seasonal nature of its business. However, this was compensated by the profit it made during the summer, giving a modest profit for the entire financial period. The financial position deteriorated during the early 1990s. It lost £35 million in 1991, its last complete 12-month period, and £24 million during the last six months of its existence until October 1992. Among the reasons for Dan - Air's decline was the lack of vertical integration with a UK tour operator. the company had contracts with 130 Tour Operators many of whom did not charter a full aircraft. The company claimed that this suited it, as they could offer the spare capacity to other small Tour Operators, who also could not justify chartering a full aircraft. Dan - Air was the last major independent provider of charter airline seats to numerous large, medium-sized and small tour companies in the UK and overseas. This was at a time when most UK Tour Operators had set up their own airlines. Thomson had started Britannia Airways early on in it's history. In 1978 Air Europe was launched with many executives on the board having been former Dan - Air directors. Many flight deck crew and cabin crew were also poached. 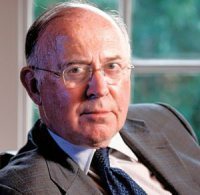 Harry Goodman's 'Intasun Holidays' were Dan - Air's biggest contractor. Although Air Europe started ith only two aircraft, it's expansion caused a major dent in Dan Air's business. Owner's Abroad was another large company Dan - Air worked with. In 1987 they too launched their own airline with Air 2000. Cosmos holidays used Monarch who initially were a small airline. With backing from Cosmos they were able to increase their fleet and utilize them with Cosmos passengers. Another major blow came when Airtours, a Manchester based Tour Operator launched it's own airline Airtours. Once again, poaching Dan - Air staff and chipping away at the number of aircraft they would charter from Dan - Air. These companies then competed with Dan-Air for the bulk of these, and other operators' business, leading to a decline in utilisation and rates. This resulted in a decline in Dan - Air's importance as a business partner for these tour operators, reducing its status from main to marginal provider. Air Europe even dropped Dan - Air Engineering as it's preferred engineering company. It appeared that Dan - Air was being attacked on all fronts. The privatisation of the hitherto state owned British Airways was a tremendous knock to all airlines. None more so than Dan - Air. BA had not only a huge network and fleet, but, when privatised, got it all for free. A share option to the public gave BA a massive cash injection. Another reason was that its fleet contained too many different, incompatible aircraft types. Some of these aircraft were older and less efficient than those operated by competitors such as Air Europe. Consequently, the Dan-Air fleet was costlier to operate and maintain. The Boeing 727s, which Dan-Air continued to acquire throughout the 1980s, including some on unfavourable leases, proved a financial millstone. Air Europe had made disparaging comments to the press that they would not be using Dan - Air's aircraft in future as they were 'Old, gas guzzling jets.' To some extent this was true. Newer types had been introduced in the 1980s. The Boeing 737 and BAe146 aircraft performed well and were comparable to any similar aircraft operated by rival airlines. Britannia and Air Europe had purchased newer, larger Boeing 757 and 767 aircraft. It was said by Dan - Air's last chairman David James "The Boeing 727s were a terrible burdon. They were so expenive to fly. we were flying them just to pay to keep them flying." Dan - Air's decision to embark on a major expansion into scheduled services from Gatwick at a time when the UK economy was still mired in the early 1990s recession made the financial position worse. The economic conditions in the UK meant that actual revenues fell short of budget in the 1991–1995 business plan, which aimed at sustained profitability by 1995 with a £42 million profit. This meant an injection of £49 million of additional working capital into Dan - Air's parent company from a successful share issue in 1990 was insufficient to fund the airline's needs. The funds raised through new shares were insufficient to standardise Dan - Air's fleet on the Boeing 737 300/400 series and the Avro RJ115 (marketed but never built). The funds were also insufficient to finance transformation from a cheap-and-cheerful charter carrier with a motley collection of poorly performing, "low visibility" regional scheduled routes into a top quality, "high visibility" mainline short-haul scheduled operator plying trunk routes. Dan - Air's last chairman, David James, said weak marketing and its charter mentality, even after the decision to make high-profile scheduled services the focus of commercial activities, was a reason it failed to achieve results. 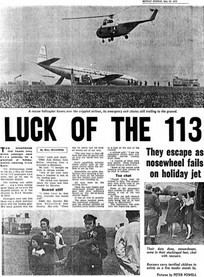 That meant that instead of making Dan-Air the airline of choice for high-yield business travellers on prime scheduled routes where it had become a major force in the wake of the demise of British Caledonian and Air Europe – such as Gatwick to Paris Charles de Gaulle – through carefully targeted marketing and publicity, Dan - Air continued selling the bulk of its scheduled inventory to consolidators and discount travel agencies, in the way it had sold its charter inventory to package tour operators. The airline saw this as risk minimisation to fill seats on scheduled services. However, Dan - Air surrendered control over its scheduled seats to third parties whose sales were volume-driven. This deprived Dan-Air of the opportunity to boost the profitability of its scheduled operation by concentrating on maximising revenues from high-yield travellers. The new board members had started along the route of making the airline a scheduled player as early as 1988. It's scheduled services had been increasing. It had benefitted from routes taken away from British Caledonian and British Airways at the time of their merger. Several Gatwick routes were up for taking and Dan - Air were awarded six. Dan - Air's 'Class Elite' was also launched in 1988. A business class cabin that meant aircraft had to be refurbished. On aircraft that had six abreast eating the centre seat would not be sold, but instead a table would be placed. On five abreast the row with three seats would also see the centre seat unsold. Arthur Larkman, a senior board member who had recently retired was not impressed with the business class name. He had reservations about the cost too. Drinks would be free, passengers would have improved in flight catering with glass ware and china as standard. The use of airport lounges was also included in the fare. More expense came in the construction of a new hanger at Gatwick for Dan - Air Engineering (DAE) costing £5.5 million . DAE had proved to be a successful company in it's own right. The new hanger would be capable of handling aircraft up to the size of a Boeing 747 400. Many experienced board members had now retired or passed away. Newer members came in their place. Dan - Air invested heavily into a computer reservation system that was way ahead of anything that it's competitors had. The 1989 results were published in 1990 and did not make good reading. Out of a turnover of £376,000,000 a loss of £3,340,000 was recorded. In a damage limitation excercise the airline sold two Airbus A300 aircraft. This off set the loss to £1,856,000. Selling the aircraft at approximately £700,000 each. By 1990 the figure was even more alarming a record turnover of £380,745,000 was recorded. The airline had carried more passengers than ever. Had a wider network and had met challenges that the Gulf War had presented. Fuel prices had increased however to alarming prices at $90 a barrell from a pre war price of $40. The Summer months of 1990 were looking healthy. However, the war began in August - the busiest month of the year. Several people cancelled their holidays or decided against flying altogether. August was also the month that airlines made requests to banks for funding to cushion them from the Winter downturn in business. In August 1990 Dan - Air's request was turned down. It was a stunning rejection. Davies and Newman had banked with Lloyds since 1922. Dan - Air had been in profit in all but two years of it's existence. At the time of the request, Dan - Air was in debt to the tune of £26,000,000 which was normal. These debts were widely known to be secured against the group's assets, of which there were many. In a twist of fate, Air Europe's bankers were also Lloyds. Their debt at this time was £90,000,000. They had financed their fleet through lease arrangements and had little in the way of assets. Furthermore, all of their office space was rented. Their first action was to waste no time trying to destroy the reputation of Dan - Air. 1990 was the year Air Europe announced that they would not be chartering ANY Dan - Air aircraft or using their maintenance services. AE announced an operating profit of £35 million. This was all because of an increase in the value of their aircraft, because of this they were able to refinance the aircraft several times. Air Europe had actaully placed orders for their planes before the Amercian operators had. This made their aircraft more valuable. However. The 1990 Gulf War brought about a spectacular collapse. In the negotiations that followed a further loan of £30,000,000 was indeed secured to Dan - Air, bringing the debt to a total of £56,000,000. However this loan came with a wide range of heavy conditions. Firstly the company would have to have a new Chairman. This meant that Fred Newman would have to step down. The New Chairman was to be David James. He would have the freedom to choose who he wanted on the board. He quickly recruited his own team, Dan - Air's Graham Hutchinson, and EC Hartwell would leave. Other names too would be leaving, but agreed to stay until replacements were found. By now as 1991 approached it and it looked like the war was almost at it's conclusion. Fuel prices had begun falling and people were once again flying. The directors who had left the board were astonished to find their services were no longer required. Between them they had years of experience in running a highly successful airline. The industry is known to be particularly specialised and it is not without dangers. Margins are low and competition is fierce. To replace board members with people from none aviation sources was a great risk. People watched with interest and worry as these new board members took over. Some of the outgoing directors were not given a formal farewell party. There was to be no formal recognition of these people from senior management in the new board room. Danny Bernstein left to become Managing Director of Monarch Airlines. His great skill in the industry saw Monarch go from strength to strength and become one of the most successful UK airlines in the 90s. Graham Hutchinson was aknowledged as a supreme airline manager, respected the all over the World. How could anyone take such a risk in removing these two people? Only three people on the board had a background in aviation. Michael Newman, John Mayes and Peter Sommers. The new Davies and Newman Chairman himself, David James was well known in the business world. He had earned the moniker 'The Company Doctor' Banks the Worldwide had recruited him to save ailing business. He was an accountant by profession and had been trained by Lloyds. James had saved companies from going under in the past, none of them however, were airlines. How could he be expected to know about this kind of industry? Others to come with James were Peter Ryan a chartered engineer and Charles White an engineer. On the board would be Roger Payton, Sir Ian Pedder and David Herbert. Herbert was a solicitor and had been deputy chairman of Dan - Air for six years. He would lose that role and instead be responsible for legal affairs, pensions and insurance. Sir Ian Peddar who had prior to the changes been Cahirman and Director of Dan - Air Services would be removed from that role and given the role of overseeing operational and engineering apects on behalf of the Dan - Air board. It was an extraordinary move. A newcomer to the board would be Roger Payon who came from the collapsed Barings Bank. John Mayes was promoted to 'Director - Airline Services'. Dan - Air's new Chairman would be Peter Ryan. Fred Newman, the man who was respected throughout the aviation World bowed out and issued a statement. He was a man known to shun away from courting publicity. He was graceful in handing power over to James and his team. Newman must have been devastated at hat was happening around him. He was widely known to have been a major force in shaping the airline. Not a soft touch by any means, but a kiind hearted, decent and honourable man. By 1991 nine of the senior directors of the company had been removed. The next move surprised everyone in the aviation World. On January 11th 1991 it was announced that a Danish engineering company called FLS Aerospace had bought Dan - Air Engineering for £27,500,000. It was an astonishing decision. Lasham Airfield had been leased by Dan - Air since 1954. It had several hangers and state - of - the - art testing equipment, ground equipment and spares. There was a second large base at Manchester with similar equipment. The newly built hanger space at Gatwick had cost more than £5 million and was able to handle the very largest of aircraft. Any debts DAE had would be almost all wiped out and all creditors would be paid. The deal had secured, for three years, the maintenance of Dan - Air's fleet. This was with a guaranteed payment of £15 million annually. In November 1990 a valuation of Dan - Air's spares in stock was carried out - The figure - £30,000,000. The sale had caused alarm in that this had seemed to happen in the blink of an eye. James announced that this was a "Happy Occasion, where both parties achieve something of major benefit" He claimed that the sale would open the way for the new Davies and Newman board to concentrate on the development in future strategy. Was the new board actually saying that an airline engineering company that gave priority to it's own aircraft, had worked with the airline since 1954, serviced the aircraft of other airlines was a hinderance to the airline? That somehow it was too difficult to manage? That it didn't want to have this company running side by side with it? In any case. The 1,600 employees would have to wait to hear their fate. Citibank had made many loans to Air Europe's parent company ILG on the security of their aircraft, and on March 7th 1991 they demanded that ILG had 24 hours to find new financing. Or they would call in all their loans. Lloyds Bank meanwhile who had been suprisingly negative to Dan - Air and had made the restrictions so wide ranging, were now trying to keep ILG afloat. This policy was understandable from Lloyds point of view. They were the Bank who ILG's owed the majority of their debts to. So misguided were Lloyds by ILG that they had attempted to persuade ILG to take over Davies and Newman as part of the D & N rescue package. As it was no financing came. Air Europe did not own any of the shiny, new aircraft in its fleet. (These were usually procured on highly favourable terms from the manufacturers and then sold upon delivery to ILG's in-house leasing subsidiaries, such as AE Finance or AE Norsk, or to third party lessors, such as Guinness Peat Aviation (GPA), from whom the airline subsequently leased them back. If you remember Air Europe had placed orders first and so the aircraft were particularly valuable as they were new on the market. This enabled AE to keep the aircraft off its balance sheet, thereby being relieved of the financial burden resulting from the aircraft's depreciation, while keeping a substantial interest in the aircraft's residual values, which were booked as profits. This sale-and-lease-back activity was a central plank of ILG's corporate strategy. It also constituted a major part of ILG's business and accounted for a large slice of its profits. Neither did the group hold the titles to the freehold of any of the properties that housed its offices and other facilities that formed an integral part of the business. Consequently the airline went bankrupt with 4,000 jobs lost. What was staggering at this point was that a huge gap in charter business had opened up. Dan - Air was ideally placed to swallow up not only this available business, but also many of the bankrupt airline's scheduled routes. It would mean that Gatwick - Paris would now not face competition from Air Europe. It could have been the saving of Dan - Air. It is widely regarded now that had they done this the airline would have gone into profit again that year. The board chose not to do this. They had already announced that they wanted to be a scheduled services airline. In fact - instead of taking on this available work they actually reduced the charter and IT work that year. To compound all that was going on in the airline even more changes took place in the board room in 1991. Vic Sheppheard was appointed to lead a large team at the Traffic department. This would cover every aspect of in flight service. Meanwhile David James addressed shareholders who had recently been invited to buy shares in a new share offer aimed at giving the company a further cash injection. He stated that his prime objective was to bring a 'return to profitablility' which he saw as being 'feasible'. He also pointed out that all of the board had come to that conclusion. Furthermore he reiterated his intention to concentrate on making the airline a scheduled services operator. Just one month later he announced that the company needed more funds. This time to the tune of £40 million. The vision the board had could only be achieved with this additional funding which he stated that the 'professional team of professional advisors' he had assembled in the board room were going to assist in the process. The majority of the new routes Dan - Air had applied to fly were ex Air Europe destinations. They had acquired some of British Airways and British Caledonian's routes at the time of their merger (Effectively a takeover) in 1987. Dan - Air had also benefitted from this, when the Government had only allowed the merger to go ahead if some of their routes were released. As it was Dan Air had gained Madrid, Lisbon and Mahon. The routes now lost by Air Europe were taken up largely by Dan - Air and to a lesser extent, British Island Airways, who took over Malta and Bucharest, only to fail on them shortly afterwards when they too went into receivership. Dan - Air meanwhile picked up Cairo, Athens, Istanbul, Rome, Malta (After BIA), Stockholm, Gibraltar, Ibiza and Brussels. Some of these were started and some to commence in 1992. Route proving is a costly excercise and over the years Dan - Air had taken great pains to work out if a route was viable before applying to commence services. In addition to flying the servece an airline would normally need a base manager, to recruit ground handling staff or use the services of a company amongst many other things. Profitable routes can suppliment loss making routes until the correct load factors are achieved. Or dropped altogether should they fail. In the case of Dan - Air their charter work was usually a safe way of ensuring this could happen. They did not have to sell charter seats, a tour operator would have the responsibility. In a world as unpredictable as scheduled air services means running at a profit is vital when implementing new routes. A risk was being taken at the expense of secure charter work. By now just two members of Dan - Air's board had an aviation background. Sir Ian Peddar and Captain John Mayes. No significant noises were made opposing the policy of mass expansion. All airlines know about route proving and implementation and how risky and expensive it is. It was simply a fact that Dan - Air did not at that time have financial muscle or flexibility to expand in this way. Dan - Air had always been far sighted and cautious about expansion. Only ever taking the chance if there was a significant cash reserve and plenty of profitable charter work to support new routes. Only then would they every add a new route. This had worked over years. Let's not forget that when the airline was carrying six million passengers almost two million of them had flown on scheduled flights. Over the years new routes had been commenced and sometimes dropped for commercial reasons. Even when this happened the number of scheduled passengers had continued to increase. Dan - Air had been fortunate in the past with having a wide variety of aircraft that flew as separate fleets. Almost like separate airlines. Where a route might have started with a 48 seater propellor aircraft, if it proved popular the company could change the type on the route to a BAC 1-11, through to a Boeing 727 with seating for up to 189 passengers such was their flexibility. Now the decison was taken to consolidate the Dan - Air fleet into just two types. The Boeing 737 and the BAe146. The £30 million loan that had been taken out was almost been paid off. Things should have began to improve on the balance sheets. Sadly, new services and new management structures with many new departments and initiatives had proved to be costly. The debt had now risen again, this time to £11,250,000, although this included the £8,750,000 arrangement fee that Lloyds had arranged. Although Fred Newman had been ousted from his role of Chairman of Davies and Newman he was could take some comfort from the sale of the ship broking company which David James now sold to Fred and Michael Newman. Through all of this the company carried on as professional as it always had been in the eyes of the public. This professionalism irked British Airways who had been losing money on it's scheduled services out of Gatwick. Various attempts were made by BA to strengthen is position at London's second airport. Long haul flights were trialed without success. The intention of turning Gatwick into a hub for UK and European feeder flights was not realised. Where it competed with Dan - Air at Gatwick it was not successful either. Talks between BA management and some of Dan - Air's board took place in October with a view of using Dan - Air as a franchise airline similar to what had been tried with success with Manx Airlines in the Isle Of Man and Loganair in Scotland. Not only would Dan - Air operate it's own schedules, but those of British Airways short haul flights from Gatwick. This was a real lifeline to Dan - Air. Talks seemed to be going well. Dan - Air would have the added advantage of having surplus aircraft that could fly it's charter programme simulataneously. At the late stages the Dan - Air team withdrew, to shock of all involved. Meanwhile UK aviation carried on. With substantial availability new airlines sprang up. Airtours International came from it's parent company. Inter European Airways began, with the backing of Aspro Holidays and Air World came on the scene. These airlines grabbed all the capacity leaving Dan - Air floundering with new scheduled routes. During the Summer months the airline reported a loss of £5 million, at a time when it had always made a profit from charter work. The Rights Issue offer in October was for 107,500,000 shares. A paltry 2,500,000 would be available to Dan - Air employees. Priced at 50p per share David James was convinced of a surge in shareholders and he claimed it 'would immediately return the airline to profit'. The reverse happened. As aviation analysts would point out - The Summer months were the most profitable for airlines. The share offer was made in the Autumn. The employees raised £1,250,000 and the share issue was a success raising £40 million - but the writing was clearly on the wall. Further expense was paid when the new board recruited John Olsen as the airline's new Group Chief Executive, David James would be group chairman. Fred Olsen had an avaition background working for Cathay Pacific for 23 years. His expertise was hoped to save the company. With him came a raft of new departments and managers. The question on everyone's lips was whether an executive used to working with a large, international airline flying long haul flights on super sized aircraft would be able to produce results with an airline with a mixed fleet of smaller aircraft and a European only operation. The company was struggling for survival and by June 1992 James once more claimed that he thought 'it reasonable to expect a return to profit for the 1992 year.' He even claimed that there was 'no dminuation of the board's confidence in the future of the company' Just three months later he announced that Dan - Air would run out of money by 'the third week of October' All the money that the airline had made during the Summer months had been passed to the banks. On top of that two BAe146 aircraft and six HS748 prop liners were sold. Shortly after that all of the company's BAC 1-11 aircraft were sold reducing the debt to £22 million. The bank would not be at any major risk with this debt as the airline still had considerable assets. By comparison Air Europe had crashed with debts reported, by the Guardian to be, £500 million. Another lifeline appeared to be thrown by Virgin Atlantic. Branson was quoted as saying that 'Dan - Air mustn't go bust'. As the final round of negotiations began in October with Virgin the two sides indicated that there would be no statement until early the next week. There were growing fears, however, that the deteriorating financial position of Dan-Air might make it impossible to agree terms. Dan- Air was rumoured to be heading for losses of between pounds £30 million and pounds £40 millon in 1992, compared with the pounds £20 million profit forecast at the time of its recapitalisation the previous year. 'It certainly isn't a pretty picture,' one source, close to the talks was quoted as saying. However, suddenly Dan - Air withdrew from the talks. British Airways were now more than ever, aware of Dan - Air's weakened position, and for a second time approached Dan - Air with a revised offer. This time they wished to purchase 14 routes from Dan - Air and it's fleet of Boeing 737 400 aircraft. Dan - Air rejected the offer. Despite heavy debts, the airline actually made a profit during the peak summer months. Assets for the company totalled almost £20 million. Was the company really in such a bad position? One must challenge that assumption. Government Ministers were invited to help with the European Commisioner for competition declining to get involved as the company was 'too small'' It would be fair to say that despite debts, the company was more or less sound. If emphasis were placed on the charter market once more then perhaps it could have returned to profitability sooner. Even more so if the risky scheduled services had paid off. On the 8th November 1992 Dan - Air was sold to British Airways for a nominal sum of £1. Negotiations had been going on for several days behind closed doors. Often into late into the night. For the purchase of £1, British Airways would take on Dan Air's financial commitments of £50 million which included debts of £37 million. For its part, British Airways got 12 of Dan-Air's most modern Boeing 737s, all of the airline's short-haul scheduled routes from Gatwick, the Heathrow–Inverness feeder service and about one-fifth of its 2,500 workers. The rost of the aircraft would be sold. Dan - Air was absorbed into British Airways's Gatwick operation. On 27 November 1992, the company's name was changed from Dan Air Services Ltd to British Airways (European Operations at Gatwick) Ltd. This rump of the former Dan-Air formed the nucleus of what British Airways intended to be a low-cost short-haul feeder for its Gatwick long-haul scheduled services, with the aim of helping to return British Airways' loss-making Gatwick operation to sustained profitability. But was that all that British Airways would get? The short answer is 'No' - Gatwick Handling was a success story in it's own right. From it's inception Dan - Air owned 50% of it. Initially with Laker Airways being the other 50% shareholder. After Laker's demise Delta bought the 50%. The vast majority of airlines at Gatwick used Gatwick Handling - it was a precious asset. The landing slots at UK airports, and for that matter European airports were of tremendous value. Particularly the daytime slots at Gatwick. People outside the industry would be unlikely to know how valuable they are. Would the new board have known this? Dan - Air owned prime real estate in the shape of their purpose built headquarters in Horley - 'Newman House' as well as Norway House in London, new offices at New City Court in the centre of the capital. Bilbao House was a large property of great value. Dan - Air also had travel companies, insurance and leasing companies. What's more the pension fund of £20,000,000 was transferred to Britiish Airways. All of the airline's flight crew had trained on specific aircraft. Only those qualified to fly Boeing 737 aircraft would go on to British Airways. Most of the Dan - Air staff were made redundant. The pilots who found themselves unemployed would have to train on other types to find work. Dan - Air were the only UK airline to use the Boeinig 727. Fortunately for them Sabre Airways set up shortly after Dan - Air's sale to capitalise on the available charter work. They used ex Dan - Air 727s and some crews found work. It is interesting to note that Sabre Airways would become XL airways and have many years of profitable flying. Some the 727's were sold to new start up airline, Cougar Airlines, who flew the 727 with ex Sabre crews. Meanwhilie the ex Dan - Air pilots had to pay for their own training to qualify on new types. Redundancy payments were not large for most people. With pilots receiving only two weeks basic pay for each year they had served in the company. In contrast the severence pay for the former board members who were in charge of the airline for the last two years received a figures totalling £742,233. Having sold aircraft and the airline with it's assets David James issued a statement. As the Company now has no assets the Board is of the opinion that that if the resolution of the voluntary winding up is not passed, the Board will have no alternative but to petition the court to wind up the Company - Yours Faithfully David N James." He later went on to say "I think what has happened is an unfortunate outcome, but it is an infinately better solution than the awuful alternative of recievership"
Some time after the event is was disclosed that British Airways was set to inherit a tax credit of between £50 million and £100 million. Even the worst case scenario would mean that by taking on Dan - Air's debt of £55 million it would benefit to the tune of £15 million for a £1 investment. The rebate was only to apply if and when Dan - Air or the new subsidiary makes a profit. The British Airways plan was to run the Gatwick arm of it's company as an independant holding company known as European Operations At Gatwick (EOAG) Dan - Air explained that this was known at the time of the takeover, but Dan - Air had no hope of making a profit so it could not claim the cash. Whilst the company folded and charter flights were grabbed by the llikes of Airtours, Air 2000, Inter European and Britannia staff tansferred to the new airline would have different contracts to the ones that they held with Dan - Air. Some would be transferred to Heathrow and many contractual obligations were now disregarded and the unions seemed powerless to intervene. Shortly after the takeover many former flight deck crew got together and with a combined effort an and with huge legal fees mounting, the crew took British Airways to a tribunal. BA was accussed of corporate arrogance. The Dan - Air crew won the case, which meant that British Airways was looking at a jaw dropping bill of up to £8million. The tribunal heard that 'The criteria adopted to make the pilots redundant was unreasonable' Michael Ingle, solicitor, representing the Dan - Air Pilot' Acton Group said that "British Airways had been disingenuous in portraying itself as Dan - Air's saviour, when in fact, it stood to gain several lucrative routes in the deal.' It was claimed that 'BA made much of the fact that it rescued Dan - Air when it completed the purchase in November 1992' Going on to say 'It now appears rather disingenuous when British Airways achieved significant benefits from the way it structured the purchase.' Lawyers claimed that it had acquired some very large tax losses but gained valuable new routes with which to boost it's loss making operation at Gatwick. 'There was a complete failure', the tribunal heard. 'To inform the pilots about their redundancies or tell them it was likely. There was also a complete failure to implement redundancies on the basis of seniority, which is traditional throughout the airline industry, including British Airways. There was also a complete failure by BA to consider if it had any alternative jobs for pilots throughout the whole group.' This successful claim was only the first hurdle in the pilots battle for compensation. On February 27th they returned to Croydon to make a claim for maximum compensation the tribunal could award, £10,000 each. After that, the airline staff planned to take their case to the High Court where they could claim up to £40,000 each which would take the BA bill to £8,000,000. One pilot claimed he was 100% sure that a former pilot, who he refused to name, had taken his life because of the upset. Several families, the pilots claimed, had split up with pilots being forced to work overseas. It was noted that most of the pilots who had found alternative jobs were paid far less than when they were at Dan - Air because of the seniority system. Having to work for another airline meant that any seniority accrued would be wiped out on commencement of service with another carrier. The pilots union BALPA was critisized by pilots for advising pilots to accept the redundancies. British Airways said that at the time of the takeover, because of Dan - Air's troubled finacial status, it was not obliged to follow normal redundancy proceedures, an argument rejected by the tribunal. Lawyers said afterwards that 'The landmark decision would allow workers rights to prevail. The press had a field day calling British Airways "Brutish Airways" and one claimed that David James had treated Dan - Air like a horse with a broken leg. But Dan - Air was no more. There is still tremendous affection for the company throughout the World. This website has had more than a million individual visits in the years it has been running. Facebook groups have been set up to reconnect staff members and this site has it's own Dan - Air Directory where people can send pictures of their time at 'Dans' as it was, and is affectionaltely known by former staff. Whatever the rank of staff and whatever the job a person had with the company held no discrimination. First name terms were the norm. People constantly refer to their time with Dan - Air as "The best working days of my life" There was a genuine affection for the company from all it's staff. We have had only one person get in touch with us to tell us how much he hated working for the company. The ribbings that the airline received were mainly unjustified. Dan - Air was an incredibly large and complex organisation. It operated superbly despite the many obsitcles. In the beginning, obsticles from Government Ministies who regulated the industry with such an iron grip that it held back independants in favour of the state run monoliths of BEA and BOAC. It consistantly grew in terms of passenger numbers and fleet size. Without a Government picking up the tab for any losses, like it would for the said airlines, BEA and BOAC. An amalgamation of the two in 1973 brought British Airways to birth. No matter how poorrly it's customer service rating was, and they were poor in the early days, and no matter how much money it lost, the state would pick up the tab. BA had the most prestigious routes from the most prestigious airports. The independants were left with the crumbs. despite this, Dan - Air grew. It's aircraft were not new in most cases in the early days. But that turned out to be an advantage as they owned them outright. Leasing aircraft was not an option and without the backing of a government or wealthy tour operator Dan - Air could not purchase them outright. In spite of that hinderence it did manage to operate largely the same aircraft at the same time as the other airlines. Let's not forget in the 1980s BA still flew Tridents from the 1960s and their BAC 1-11s were still flying at the takeover in 1992. In the sixties it was fair to say that Dan - Air aircraft were a mish mash of old piston aircraft. Did other independants have better aircraft? Certainly not. Britannia and Monarch were flyiing Bristol Britannia aircraft well into the 1970s. Caledonian flew across the Atlantic in DC7 piston prop liner aircraft in the late 1960s when Dan Air had began to re equip with jets. If one reads the cabin staff manuals from Dan - Air one will see just how rigorous the standards were for in flight service. Even cabin crew uniform regulations and where they stood on an aircraft or at the foot of the steps to greet passengers came with strict rules. Testimony to that finesse is that Air Europe poached Dan - Air's chief stewardess to train their new recruits. The standard of service was envied the World over. Many cabin crew members have since gone onto fly with the World's major airlines reaching very senior positions. It goes without saying that the same thing happened with flight deck crew. Their engineers continued with their new company at Lasham and with a new owner, many of the younger Dan - Air Engineering staff are still working. Dan - Air was a safe airline. One can forget the very early days when start up operators flew by the seat of their pants in a gung ho style. Those days saw carriers flying cargo in old, ex RAF aircraft. Navigation aids were poor and aircraft performance not much better. Faults, sadly were inevitable. 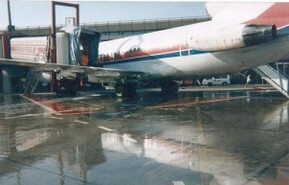 Dan Air survived and improved while other carriers rightly went out of operation. By the time Dan - Air had a period in it's history it would rather not have happened, one cannot find a single of those tragic accidents where the airline was to blame. Not for it's crews, it's safety proceeedures or it's technical standards. The capability of DAE was second to none. Rated by the CAA and the FAA in America, it maintained aircraft belonging to Royalty as well as private aircraft and the aeroplanes of other operators. The type of work undertaken by some of Dan - Air's operation with oil related work in the Shetlands carried higher risks at the time than flying a jet to Alicante. Other airlines had major disasters throughout their history. The aviation rule was never to critisize another airline's safety record because the next time it might be one of your aircraft that goes down. Despite that, an investigation was ordered to carried out on the airline. Even then, the CAA found nothing of any major concern. It was a great airline - going about it's busines. This website pays tribute to the skill of the airline and the great esteem with which it is held. From 1953 to 1987, Dan-Air had its headquarters at the City of London in Bilbao House. 12th June 1968 a Dan Air Comet returning from Palma to Gatwick with 95 passengers on board was approaching Gatwick with a suspected engine fault. The cabin filled with smoke. The aircraft landed safely without incident. Fire crews and ambulances were on standby. The problem was caused by an electrical fault. Smoke was detected in both the cabin and flight deck. Passengers evacuated the aircraft via slide. Nobody was hurt. In 1971, one of the airline's Comets operating a charter flight carrying Turkish migrant workers from Berlin Tegel to Istanbul was "escorted" by Bulgarian fighter aircraft into Sofia. The crew flying the aircraft was attempting to take the shortest route to Istanbul when leaving Yugoslav airspace by entering Bulgarian airspace, instead of taking the longer route through Greek airspace. They were not aware of the then communist government of Bulgaria's decision not to let any aircraft enter its airspace whose flight had originated or was going to terminate at a West Berlin airport, without stopping en route at another airport outside West Berlin. The aircraft landed safely at Sofia. It was released along with its crew and passengers when the flight's commander paid the fine the Bulgarian authorities had imposed for violating their country's airspace. In May 1972 (19th) A Comet returning to Manchester from Alicante had indicators in the flight deck saying there was a problem with the undercarriage. Passengers were informed about the problem. The aircaft flew around Gatwick burning fuel before being diverted to Manston. The runway was coated with foam and the aircraft landed. The undercarriage did indeed collapse on impact with the runway. 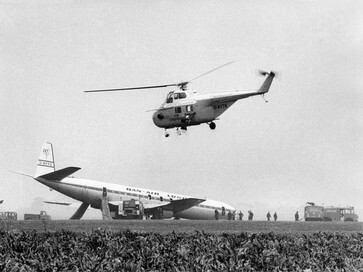 The aircraft carried along the runway before stopping. Fire was averted with the spraying of foam. The Comet was carrying 113 passengers plus crew. Passengers were told to adopt the brace position for landing. Luckily no one was hurt. Few were treated for shock before being ferried by coach onwards to their final destination of Manchester. Please read our newspaper article and picture by clicking the thumbnail images. In 1973, Somali fighter aircraft forced a Dan-Air Boeing 707 flying through Somali air space en route from London Gatwick to the Seychelles and Mauritius with 83 passengers on board to land at Mogadishu Airport. Captain Tony Kirk was in command. The aircraft was flying through Somali airspace in violation of the prescribed procedure to apply for permission to do so in advance, as a result of an "administrative oversight" on the airline's part. As a consequence of this violation, the aircraft's captain was taken to court and a fine of £600 was imposed on the airline. In 1974, one of the company's Boeing 727s (a Boeing 727–46, registration: G-BAEF) hit the localiser antenna of Luton Airport's Instrument Landing System while taking off on a charter flight to Corfu, rendering the system inoperative. The aircraft diverted to London Gatwick where it landed safely. 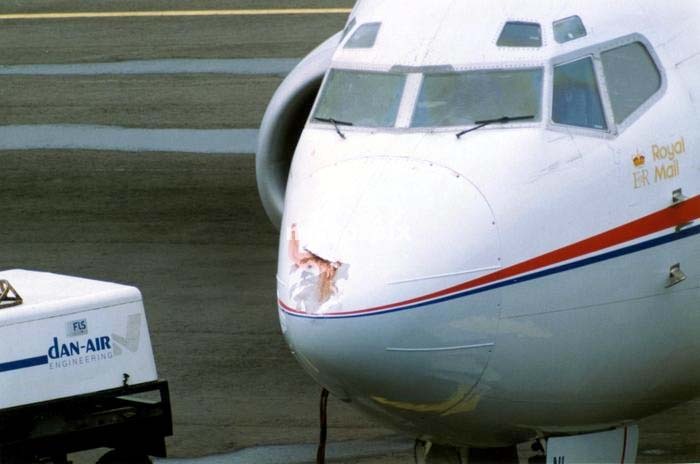 February 23rd 1978 a company HS 748's wingtip smashed the flight deck window of a French Caravelle and then hit another Dan Air HS 748 at Aberdeen. The two Dan Air arcraft were put out of operation and repairs carried out on site. February 26th 1978 for the second time in three day Aberdeen aiport saw a Dan Air aircraft in trouble. A company HS748 made a full scale emergency landing at the airport with fire crews and ambulances in attendance. The airport praised the skill and professionalism of the crew who landed the aircraft without incident. August 2nd 1979 a company HS 748 made an emergency landing at Glasgow airport. In 1979 a company HS748 landed in Sumburgh, Scotland. The aircraft had come in a little too fast and was fast running out of space to stop on the icy runway. The crew decided to divert onto the grass. The propellor blades bucked and the front landing gear collapsed. Fire crews were on scene shortly afterwards. There was no evacuation of the aircraft. Parts were flown into the island and a repair carried out on site. The aircraft returned to service. In January 1984 a Handley Page Dart Herald airliner owned by British Air Ferries and on lease to Dan-Air was invovled in a full scale emergency alert after a wheel brake failsafe light had lit up, on its outward flight to Stavanger. Upon completing the repair and run-up of the faulty engine that had caused a rejected takeoff due to an engine oil warning at Berlin Tegel during the late 1980s, a Dan-Air Boeing 727–200Adv. collided with a jetway at the airport's terminal building while maintenance engineers taxied the aircraft back to its stand. This badly injured the ground crew member manning the jetway and ruptured the fully refuelled aircraft's centre wing tank at the left wing root. As a result, a large quantity of jet fuel spilled onto the tarmac. The maintenance engineers' failure to pressurise the aircraft's hydraulics had resulted in a complete loss of hydraulic pressure just before reaching the stand, making it impossible to steer the aircraft and rendering the brakes ineffective. 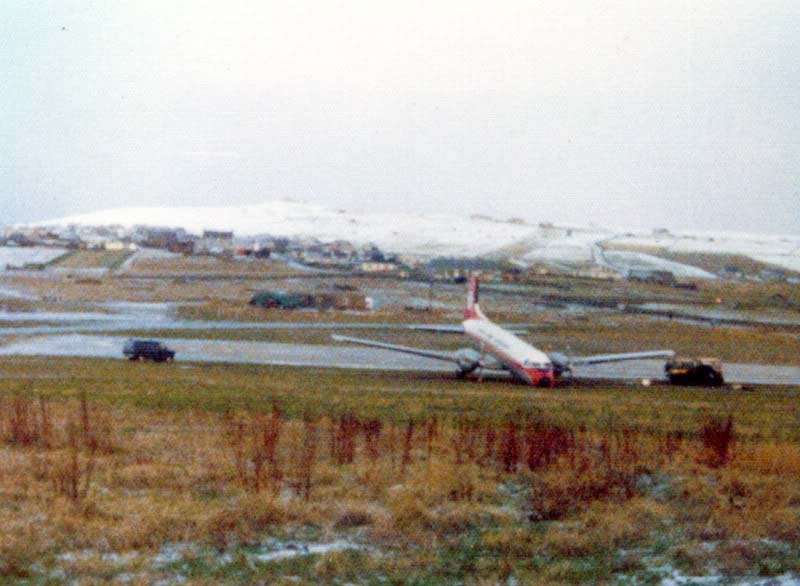 On 2 March 1989, a Dan Air HS 748 mistakenly landed at Langford Lodge Airport instead of the nearby Belfast Aldergrove Airport, the intended destination of the scheduled service from Newcastle. When the aircraft broke cloud over Lough Neagh on short finals for Aldergrove's runway 07, the pilot in command thought what he had spotted was the correct runway and proceeded to land the plane at what turned out to be the adjacent, privately owned, Langford Lodge airfield, just under a mile short of the approach to runway 07 at Aldergrove. On 6th May 1992 A Dan Air Boeing 737 with 125 passengers and 4 crew on board made an emergency landing at Newcastle Airport after flying into a flock of birds. Emergency services were scrambled when the aircraft turned back just a few minutes after take-off. The plane landed safely and shaken passengers were taken back to the terminal to wait for a replacement jet for their flight to Lanzarote. You can see the larger image by clicking on it.